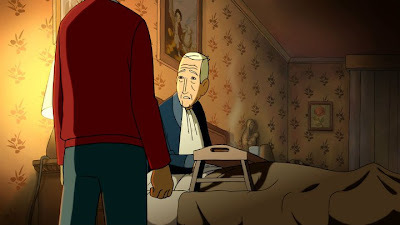 Following a wave a success in Europe, the Spanish animated feature Arrugas (Wrinkles) made its North American Premiere last night at the Ottawa International Animation Festival. Arrugas was a hot pic to begin the festival’s feature competition, as it was recently named a nominee for Best Animated Film at the European Awards following its double win at Spain’s Goya awards where it won Best Animated Feature and Best Adapted Screenplay. It’s needless to say that Arrugas is a winner. Reminiscent of 2009's Up through its moving portrayal of animated old folks, Arrugas is less concerned on creating a sentimental pull and more focused on the reality of the elderly. The wrinkles to which the title refers are those scribbly lines working their way across the face of Emilio (voiced by Tacho González). The film begins with Emilio as a younger man. A banker, Emilio is smart and fixated on his job until he finds himself distracted by a bowl of soup. As the noodles squiggle, so too does the skin of Emilio’s weathered face as the image changes to a bedridden old man. Emilio is confused by the switch, which frustrates his son who is trying to act as a caregiver. Emilio is greeting worse with age. His mind us tripping, he repeats himself, and he gets muddled easily. To make things simpler for Emilio, or perhaps for himself, Emilio’s son ships him off to a retirement home. Emilio is slow to adjust to his new surroundings. Luckily, though, Emilio is befriended by his wily old roommate, Miguel (Álvaro Guevara), who shows him the ins and outs of the home. It’s a quiet place, as one can see, where sedate geriatrics sleep wherever their feet may rest. “It’s like a waiting room,” Emilio says. Presumably, he means that it’s a place where people wait to die. Then there’s Emilio. Emilio feels himself slipping away during his stay in the home. As he loses more and more of his possessions, not to mention his sense of self, Emilio recognizes that he is getting closer to the end of his life. The final stage is marked by a transition to the second floor. Like the ominous 'second floor' in Sarah Polley’s Away from Her, the second floor in Arrugas is a place of no return for the most incapacitated residents. As with Fiona’s experience on the second floor, however, Arrugas shows how one can truly make the most of life in its final, fleeting stages. Directed by Ignacio Ferreras and adapted from the comic book by Paco Roca, Arrugas is a touching and mature celebration of life. Arrugas complements its salute to the golden oldies by telling its tale in colourful hand-drawn animation. The classical look of the film seems far more fitting to a story of retirees than does the energetic 3D computer animation of Pixar’s Up, but the difference between the two films shows how both styles of animation are still relevant and attractive. Arrugas is a handsome film, and it’s a touching and funny one, too. Life in the retirement home isn’t all that gloomy, for Miguel does his best to teach Emilio how to embrace the demise of old age with some hearty humour. Particularly funny is the essential “dirty old man scene” in which Miguel takes Emilio for the weekly highlight at the home: exercise class. The gents don’t move a muscle but the do break a sweat over their ample-bosomed aerobics instructor. The class gives time for some of the residents to catch some zees, too, which makes for a hilarious scene as the teacher tries to throw them a ball. The ball provides a pivotal turn for the film, as it gives Emilio an important reminder of his fate. Arrugas balances the tragicomedy of Emilio’s decline rather well by giving an appropriate shift when needed. A similar transition marks the end of the film, which offers the most colourful, magical moment of the film and celebrates the inevitable journey shared by all. A lively, bittersweet film, Arrugas feels timeless. Arrugas screens again on Sunday, September 23rd at 11:00 am at Empire Theatres – Rideau. For more information on the Ottawa International Animation Festival, please visit www.animationfestival.ca.